This site traces the ancestry of selected French and German Creole families* who settled in La Louisiane de la Nouvelle-France during the 18th-19th centuries, mostly concentrated in the Central Louisiana Parishes of Avoyelles, Pointe Coupée, and St. Landry, as well as the Mississippi River Parishes of Ascension, East & West Baton Rouge, Iberville, Orleans, St. Charles & St. John the Baptist (German Coast), and St. James. Featured surnames in Avoyelles and Pointe Coupée Parishes include BARBIN de BELELVUE BORDELON CAILLETEAU CAPPEL CASSÉ (La CASSÉ) COCO COUVILLON DUCÔTÉ DURAND ESCUDÉ GRÉMILLION GAUTHIER GOUDEAU JOFFRION LABORDE LEMOINE MAYEUX MONCLA MOREAU PLAUCHÉ RABALAIS REGARD ROY (Le ROY) SAUCIER and others. 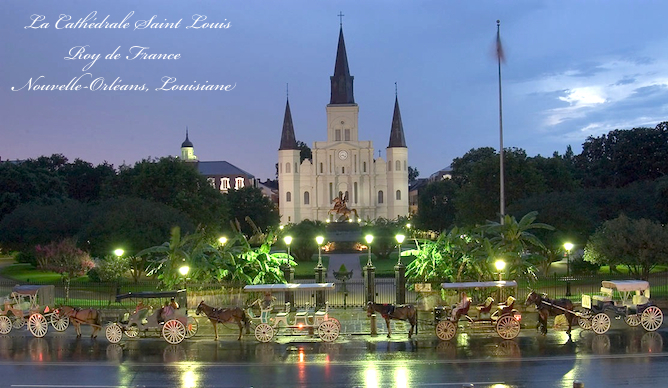 Featured surnames in the Mississippi River Parishes include BONIN BOURGEOIS CHABOISSEAU CHAUDOIR COURRÈGE D'AUTERIVE DeBLANC de MARI (MARY) desNOYERS DuPONT HAYDEL HECK JUDICE LANDAICHE LANDÈCHE LeBLANC NOËL ROUSSEL SCHEXNAYDRE SONGY STECKLER TOUPS TROSCLAIRE WEBRE WEEDEN and others. *Although not the focus of this site, it does include some Acadian (Cajun) families exiled from Nova Scotia. Who or What is a Louisiana Créole?